With so many Blackjack variants on offer in the game suite of Microgaming software powered online casinos, you should do some investigating to find out just how good each one pays and plays before sitting down to play any of them. 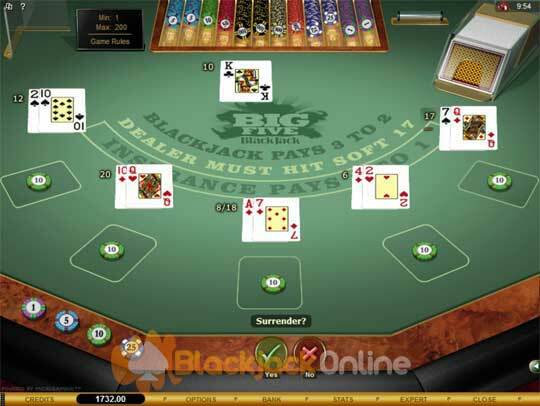 Take the Big Five Blackjack game, even though the rules are quite liberal in nature, it certainly isn’t one of the most played Blackjack games Microgaming offers, and this maybe due to the house edge which this game boasts. The house edge, when you play Big Five Blackjack with perfect strategy is some 0.47%. 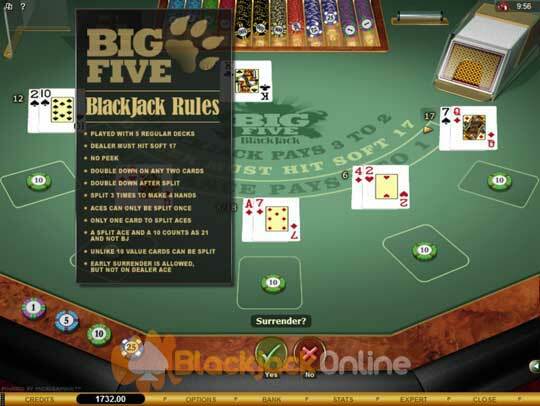 Due to the game play rules in operation on this card game, we would recommend that you save our Big Five Blackjack Strategy Card (bottom) and use it whenever you play this game at a Microgaming online casinos. It will enable you to play perfect strategy without having to think too hard about what moves to make! Playing a Pair of Nines - You should split a hand when it contains a pair of nines, but never when the dealers up card is either a 7, 10 or an Ace, on such occasions you should stand your hand. Hitting a Hard 13 - If the dealer has dealt you that terrible hand which is a hard thirteen, then you should always hit is whenever the dealers up card is a 7 to Ace card, any other dealers up facing card, namely the 2 to 6 cards, will call for you to stand that hand. Early Surrender - You may be wondering when is the best time to take the Early Surrender option when playing Big Five Blackjack. Well, if the dealer is showing a ten valued card, and you have either a hard 14, 15 or 16 or a pair of 7’s or 8’s or you have a hard 16 and the dealer is showing a nine, then those are the only times to cut your losses and take the Early Surrender option! Dealer Rules - When the dealer has a hand with a value of a soft 17 or lower, then he will hit that hand, all hard 17 and above valued hands will result in him standing those hands. The dealer is using a 5 deck shoe, and the dealer never checks for a possible Blackjack hand, as it is a no peek game. Player Rules - Let’s take a look what the player can do with certain hands. A double down may be performed on any two cards, and also when a hand has been split. Splitting a hand is of course allowed, and you can split a hand three times, but split Aces will be dealt just one card and a pair of Aces may be split just once. Early Surrender is also able to be taken by a player. An unmatched pair of ten valued cards can be split also! Payouts - There are no differences in the standard payouts on offer on this Big Five Blackjack game, and as such you will get a winning payout of 3 to 2 for a Blackjack hand, with all other winning hands being paid at even money (this includes a split Ace with a ten valued card). Should you have placed the Insurance wager, and it has been successful then the payout awarded for this is 2 to 1.